8 advanced bioelectrical therapy modes with 20 intensity settings. 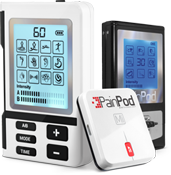 The PainPod XPV features 8 advanced bioelectrical therapy modes with 20 intensity settings available. This model features two ports so you can have four pads with the same mode and frequency for fast relief from pain and muscle stimulation. 8 scientifically developed therapy modes. Enjoy up to 25 hours of battery life before charging. Built in back-light allowing easy navigation. For a limited time 1 bonus pair of Large Econo Pads will be included!